Finally an alternative to the standard flat drape face rest covers, or the nurse's cap styles we all have used. 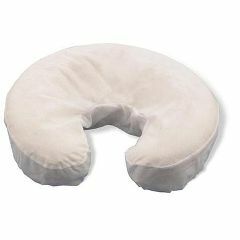 These disposable face rest covers look clean and professional and fit most face rest pads. No need to create a hole. This model has one built in. Made of a soft, comfortable, cotton-polyester blend that is spun-bound for extra softness. These disposable face covers are used to protect the face pad and the client's face from germs and bacteria (one time use only). Latex Free. 50 package. Available in white or black.